Soviets liberate all of Byelorussian SSR and gain foothold in eastern Poland; placing themselves within striking distance of Berlin. Operation Bagration (/bʌɡrʌtiˈɒn/; Russian: Oперация Багратио́н, Operatsiya Bagration) was the codename for the Soviet 1944 Belorussian Strategic Offensive Operation (Russian: Белорусская наступательная операция «Багратион», Belorusskaya nastupatelnaya Operatsiya Bagration) during World War II, which cleared German forces from eastern Poland between 22 June and 19 August 1944. 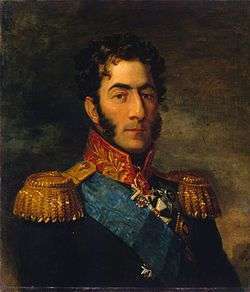 The operation was named after 18th–19th century Georgian Prince Pyotr Bagration, general of the Imperial Russian Army who was mortally wounded at the Battle of Borodino. The Soviet armies directly involved in Operation Bagration were the 1st Baltic Front under Army General Ivan Bagramyan, the 1st Belorussian Front commanded by Army General Konstantin Rokossovsky, the 2nd Belorussian Front commanded by Colonel-General G. F. Zakharov, and the 3rd Belorussian Front commanded by Colonel-General Ivan Chernyakhovsky. The Red Army successfully used the Soviet deep battle and Maskirovka strategies for the first time to full extent, albeit under continuing heavy losses. Operation Bagration diverted German mobile reserves to the central sectors, removing them from the Lublin-Brest and Lvov–Sandomierz areas, enabling the Soviets to undertake the Lvov–Sandomierz Offensive and Lublin–Brest Offensive. This allowed the Red Army to reach the Vistula river and Warsaw, which in turn put Soviet forces within striking distance of Berlin, conforming to the concept of Soviet deep operations — striking deep into the enemy's strategic depths. Army Group Centre had previously proved tough to counter as the Soviet defeat in Operation Mars had shown. But by June 1944, despite shortening its front line, it had been exposed following the withdrawals of Army Group South in the battles that followed the Battle of Kursk, the Second Battle of Kiev and the Crimean Offensive in the late summer, autumn and winter of 1943–44. Operation Suvorov had seen Army Group Centre itself forced to retreat westwards from Smolensk during the autumn of 1943. By the middle of June 1944, the Western Allies on the Cotentin Peninsula were just over 1,000 km (620 mi) from Berlin, while the Soviet forces at the Vitebsk Gate were within 1,200 km (750 mi) of the German capital. For the Third Reich, the strategic threats were about the same. Hitler underestimated the threat posed by Soviet troops facing Army Group Centre, and had redeployed ⅓ of Army Group Centre's artillery, ½ their tank destroyers and 88% of their tanks to the Southern front where the German high command expected the next major Soviet offensive. Army Group Centre only had a total of 580 tanks, tank-destroyers and assault guns. They were opposed by over 9000 Soviet machines. The redeployment of forces from Army Group Center left only 80 men defending every kilometer of the front line. Bagration, in combination with the neighboring Lvov-Sandomierz Offensive launched a few weeks later in Ukraine, allowed the Soviet Union to recapture Belorussia and Ukraine within its 1941 borders, advance into German East Prussia, but more importantly, the Lvov-Sandomierz operation allowed the Red Army to reach the outskirts of Warsaw after gaining control of Poland east of the Vistula river. The operation enabled the next operation, the Vistula–Oder Offensive, to come within sight of the German capital. The Soviets were initially surprised at their success of the Belorussian operation which had nearly reached Warsaw. The Soviet advance encouraged the Warsaw uprising against the German occupation forces. The battle has been described as the triumph of the Soviet theory of "the operational art" because of the complete co-ordination of all the Strategic Front movements and signals traffic to fool the enemy about the target of the offensive. The military tactical operations of the Red Army successfully avoided the mobile reserves of the Wehrmacht and continually "wrong-footed" the German forces. Despite the huge forces involved, Soviet front commanders left their adversaries completely confused about the main axis of attack until it was too late. The Oberkommando des Heeres expected the Soviets to launch a major Eastern Front offensive in the summer of 1944. The Stavka considered a number of options. The timetable of operations between June and August had been decided on by 28 April 1944. The Stavka rejected an offensive in either the L'vov sector or the Yassy-Kishinev sectors owing to the presence of powerful enemy mobile forces equal in strength to the Soviet strategic fronts. Instead they suggested four options: an offensive into Romania and through the Carpathians, a gigantic offensive into the western Ukrainian SSR aimed at the Baltic coast, an attack into the Baltic and an offensive in the Belorussian SSR. The first two options were rejected as being too ambitious and open to flank attack. The third option was rejected on the grounds the enemy was too well prepared. The only safe option was an offensive into Belorussia which would enable subsequent offensives from Ukraine into Poland and Romania. The Soviet and German High Commands recognised western Ukraine as a staging area for an offensive into Poland. The Soviets, aware that the enemy would anticipate this, engaged in a maskirovka campaign to catch the German armoured forces off guard by creating a crisis in Belorussia that would force the Germans to move their powerful Panzer forces, fresh from their victory in the First Jassy–Kishinev Offensive in April–June 1944, to the central front to support Army Group Centre. This was the primary purpose of Bagration. The bulk of tactical resources, in particular anti-tank artillery, was allocated to the 1st Ukrainian Front, the spearhead of the Vistula, L'vov-Premyshl operation. 38 of the 54 anti-tank regiments allocated to the Belorussian-Baltic-Ukrainian operations were given to the 1st Ukrainian Front. This demonstrates that the Soviet plans for the L'vov operation were a major consideration and whoever planned the offensive was determined to hold the recently captured territory. The target for this operation was the Vistula Bridgehead and the enormous anti-tank artillery forces helped repulse big counter-attacks by German armoured formations in August–October 1944. One American author suggests that these Soviet innovations were enabled, in part, by the provision of over 220,000 trucks by the United States to motorize the Soviet infantry. Most of the aviation units, fighter aircraft and assault aviation (strike aircraft) were given to the L'vov operation and the protection of the 1st Ukrainian Front. Of the 78 fighter and assault aviation divisions committed to Bagration, 32 were allocated to the L'vov operation, nearly fifty percent of the aviation groups committed to Bagration and contained more than was committed to the Belorussian operation. This concentration of aviation was to protect the Vistula bridgeheads against air attack and to assault German counter offensives from the air. On 19 June Army Group Centre noted in its estimate of the enemy situation that the concentration of enemy air forces had become greater (4,500 out of 11,000) and that this left new doubts regarding OKH's estimate. OKH saw no ground for this supposition. Shortly before the beginning of the Soviet offensive, the army commands had detected some enemy forces near the front and had identified the places where the main Soviet attacks would take place, with the exception of 6th Guards Army near Vitebsk. The Soviet strategic reserves were not detected. The start of Operation Bagration involved many partisan formations in the Belorussian SSR, which were instructed to resume their attacks on railways and communications. From 19 June large numbers of explosive charges were placed on rail tracks and though many were cleared, they had a significant disruptive effect. The partisans were also used to mop up encircled German forces once the breakthrough and exploitation phases of the operation were completed. The Stavka had committed approximately 1,700,000 combat and support troopers,[Gc 1] approximately 24,000 artillery pieces and mortars, 4,080 tanks and assault guns and 6,334 aircraft. German strength was approximately 800,000 combat and support troopers and 9,500 artillery pieces but only 553 tanks and assault guns and 839 aircraft. Army Group Centre was seriously short of mobile reserves: the demotorized 14th Infantry Division was the only substantial reserve formation, though the 20th Panzer Division was positioned in the south near Bobruisk and the understrength Feldherrnhalle Panzergrenadier Division was also held in reserve. The relatively static lines in Belorussia had enabled the Germans to construct extensive field fortifications, with multiple trench lines to a depth of several kilometres and heavily mined defensive belts. The Wehrmacht's forces were based on logistic lines of communications and centres, which on Hitler's orders were declared Feste Plätze (fortified towns to be held at all costs) by OKH. General Jordan of 9th Army was very worried at how vulnerable this immobility made the Army, correctly predicting that "if a Soviet offensive breaks out the Army will either have to go over to a mobile defence or see its front smashed". However, because the initial offensive in Belarus was thought to be a feint, the Feste Plätze spanned the entire length of the Eastern Front. North to south these Feste Plätze were designated as follows. Army Group North had Feste Plätze at Reval (Tallinn), Rakvere, Jõhvi, Dorpat (Tartu), Pleskau (Pskov), Ostrov, Opochka, Rēzekne. Army Group Centre had Feste Plätze at  Polotsk, Vitebsk, Orsha, Mogilev, Baranovichi, Borisov, Minsk, Babruysk, Slutsk, Luninets, Pinsk, Kovel, Vilnius. Army Group Northern Ukraine had Feste Plätze at Brody, Tarnopol, Proskurov, Zhmerynka. Army Group Southern Ukraine had Feste Plätze at Vinnitsa, Uman, Novoukrainka, Pervomaisk, Voznesensk, Nikolayev. The 1st Belorussian Front was particularly large, and included further units which were only committed during the following Lublin-Brest Offensive. Operation Bagration began on 22 June 1944, the same calendar day on which the Germans had previously invaded the Soviet Union in 1941, with probing attacks throughout the German lines. The main offensive began in the early morning of 23 June, with an artillery bombardment of unprecedented scale against the defensive works. Within hours, some sectors of the German defenses were in danger of being breached. The first phase of Soviet deep operations, the "deep battle" envisaged breaking through the tactical zones and forward German defences. Once these tactical offensives had been successful, fresh operational reserves exploited the breakthrough and the operational depths of the enemy front using powerful mechanized and armoured formations to encircle enemy concentrations on an Army Group Scale. The operation was conducted by the 1st Baltic Front and 3rd Belorussian Front against the positions of the Third Panzer Army, and the northern flank of the Fourth Army. In the north, the 1st Baltic Front pushed the IX corps over the Dvina, while encircling the LIII Corps in the city of Vitebsk by 25 June. To the south, the 3rd Belorussian Front drove through the VI Corps, shattering it. Vitebsk was taken by 27 June, the entire LIII Corps of 30,000 men being destroyed. The 3rd Belorussian Front simultaneously opened operations against Fourth Army's XXVII Corps holding Orsha and the main Moscow-Minsk road. Despite a tenacious German defense, Orsha was liberated by 26 June, and the 3rd Belorussian Front's mechanized forces were able to penetrate far into the German rear, reaching the Berezina River by 28 June. The primary aim of the Mogilev Offensive, and of the 2nd Belorussian Front, was to pin down the majority of Fourth Army while the developing Vitebsk-Orsha and Bobruysk Offensives encircled it. The 2nd Belorussian Front's units attacked on 23 June, aiming to force crossings of the Dnepr against two of Army Group Centre's strongest corps, the XXXIX Panzer Corps and XII Corps. The Dnepr was crossed by the 49th Army by 27 June, and by 28 June it had encircled and taken the town of Mogilev. The XXXIX Panzer Corps and XII Corps began to fall back towards the Berezina River under heavy air attack, but were retreating into a trap. The Bobruysk Offensive, against Ninth Army on the southern flank of Army Group Centre, was opened by the 1st Belorussian Front on 23 June, but suffered heavy losses attempting to penetrate the German defenses. Rokossovsky ordered additional bombing and artillery preparation, and launched further attacks the next day. The 3rd Army broke through in the north of the sector, trapping the German XXXV Corps against the Berezina. The 65th Army then broke through the XXXXI Panzer Corps to the south; by 27 June, the two German corps were encircled in a pocket east of Bobruysk under constant aerial bombardment. Some elements of Ninth Army managed to break out of Bobruysk on 28 June, but up to 70,000 soldiers were killed or taken prisoner. 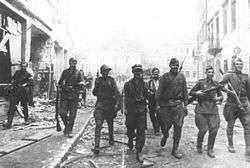 The 1st Belorussian Front's forces liberated Bobruysk on 29 June after intense street fighting. The second phase of Operation Bagration involved the entire operation's most significant single objective: the retaking of Minsk, capital of the Belorussian SSR. It would also complete the large-scale encirclement and destruction, set up by the first phase, of much of Army Group Centre. From 28 June, the main exploitation units of the 3rd Belorussian Front (the 5th Guards Tank Army and an attached cavalry-mechanised group) began to push on to secure crossings of the Berezina, followed by the 11th Guards Army. In the south, exploitation forces of the 1st Belorussian Front began to close the lower pincer of the trap developing around the German Fourth Army. The Germans rushed the 5th Panzer Division into Belorussia to cover the approaches to Minsk, while the units of Fourth Army began to withdraw over the Berezina crossings, where they were pounded by heavy air bombardment. After forcing crossings of the Berezina, Soviet forces closed in on Minsk. The 2nd Guards Tank Corps was the first to break into the city in the early hours of 3 July; fighting erupted in the centre, which was finally cleared of German rearguards by the following day. The 5th Guards Tank Army and 65th Army closed the encirclement to the west of Minsk, trapping the entire German Fourth Army, and much of the remnants of Ninth Army. The 1st Baltic Front successfully pursued the retreating remnants of Third Panzer Army back towards Polotsk, which was reached by 1 July. German forces attempted to organise a defense using rear-area support units and several divisions hurriedly transferred from Army Group North. The Šiauliai Offensive covered the operations of the 1st Baltic Front between 5 and 31 July against the remnants of Third Panzer Army; its main objective was the Lithuanian city of Šiauliai (Russian: Shyaulyai; German: Schaulen). The Vilnius Offensive was conducted by units of the 3rd Belorussian Front subsequent to their completion of the Minsk Offensive; they were opposed by the remnants of Third Panzer and Fourth Armies. Units of Fourth Army, principally the 5th Panzer Division, attempted to hold the key rail junction of Molodechno, but it was taken by units of the 11th Guards Army, 5th Guards Tank Army and 3rd Guards Cavalry Corps on 5 July. German forces continued a precipitate retreat, and Soviet forces reached Vilnius (Russian: Vilna; Polish: Wilno), held by units of the Third Panzer Army, by 7 July. By 8 July, the city had been encircled, trapping the garrison, who were ordered to hold fast at all costs. Soviet forces then fought their way into the city in intense street-by-street fighting (alongside an Armia Krajowa uprising, Operation Ostra Brama). On 12 July, 6th Panzer Division counter-attacked and temporarily opened an escape corridor for the besieged troops, but the majority of them were lost when the city finally fell on 13 July (this phase of the operation is commonly known as the Battle of Vilnius). On 23 July, the Fourth Army commander, Hoßbach, in agreement with Model, committed the newly arrived 19th Panzer Division into a counter-attack with the intention of cutting off the Soviet spearheads in the Augustow Forest. This failed. The Belostock Offensive covered the operations of 2nd Belorussian Front between 5 and 27 July, with the objective of the Polish city of Białystok. The 40th and 41st Rifle Corps of 3rd Army, on the front's left wing, took Białystok by storm on 27 July, after two days of fighting. Compared to other battles, this was by far the greatest Soviet victory in numerical terms. The Red Army liberated a vast amount of Soviet territory whose population had suffered greatly under the German occupation. The advancing Soviets found cities destroyed, villages depopulated, and much of the population killed, or deported by the occupiers. 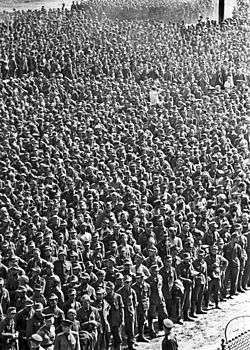 In order to show the outside world the magnitude of the victory, some 50,000 German prisoners, taken from the encirclement east of Minsk, were paraded through Moscow: even marching quickly and twenty abreast, they took 90 minutes to pass. The German army never recovered from the materiel and manpower losses sustained during this time, having lost about a quarter of its Eastern Front manpower, similar to the percentage of loss at Stalingrad (about 17 full divisions). These losses included many experienced soldiers, NCOs and commissioned officers, which at this stage of the war the Wehrmacht could not replace. An indication of the completeness of the Soviet victory is that 31 of the 47 German divisional or corps commanders involved were killed or captured. Of the German generals lost, nine were killed, including two corps commanders; 22 captured, including four corps commanders; Major-General Hahne, commander of 197th Infantry Division disappeared on 24 June, while Lieutenant-Generals Zutavern and Philipp of the 18th Panzergrenadier and 134th Infantry Divisions committed suicide. ↑ Adair, pages 85–86, estimates 2,500,000 men, half in the front line and half in support. 1 2 3 4 5 6 7 Frieser 2007, p. 534. ↑ Glantz & Orenstein 2004, p. 4. 1 2 Glantz & House 1995, p. 132. 1 2 Glantz & Orenstein 2004, p. 176. 1 2 3 4 Bergstrom 2008, p. 82. 1 2 Glantz & House 1995, p. 298. 1 2 Krivosheev 1997, p. 203. ↑ Not to be confused with the 1943 Belorussian Strategic Offensive Operation (3 October–31 December 1943). ↑ Willmott 1984, p. 154. ↑ Mazower 2008, pp. 522–3. ↑ Watt 2008, p. 670. 1 2 Ziemke 1969, p. 11. ↑ Watt 2008, pp. 699–700. ↑ Watt 2008, pp. 673–4. ↑ Glantz 1989, pp. xxxvii–viii. ↑ Watt 2008, p. 683. ↑ Watt 2008, p. 685. ↑ Watt 2008, pp. 683–4. ↑ Watt 2008, p. 684. ↑ Watt 2008, p. 686. ↑ Watt 2008, p. 687. 1 2 Watt 2008, p. 690. 1 2 Watt 2008, p. 691. ↑ Watt 2008, p. 692. ↑ Watt 2008, pp. 691–3. ↑ Niepold 1987, pp. 22–3. ↑ Niepold 1987, p. 28. ↑ Niepold 1987, pp. 31–2. ↑ Adair 2004, p. 69–80. ↑ Adair 2004, p. 66–68. ↑ Adair 2004, p. 67. ↑ Adair 2004, p. 173–175. ↑ Adair 2004, p. 175–176. ↑ Adair 2004, p. 87. ↑ Glantz & House 1995, pp. 206–7. ↑ Glantz & House 1995, pp. 207–9. ↑ Glantz & House 1995, p. 209. ↑ Glantz 2002, p. 1. 1 2 Zaloga 1996, p. 71. Connor, William M. (1987). "Analysis of Deep Attack Operations: Operation Bagration, Belorussia, 22 June – 29 August 1944" (PDF). Fort Leavenworth, KS: Combat Studies Institute. Retrieved 18 March 2012.